I love to walk around for hours deep in the labyrinth of souks that interweave the old city in Aleppo. I lose myself in the crowds, chat with vendors, drink coffee with strangers, and take in my surroundings. It’s an exhilarating feeling. The chatter, the people, the sales, the merchandise–it’s all a very lively experience. In Aleppo there are souks, or traditional Arab markets, for almost everything: clothing, gold, jewelry, food. Stores selling almost identical merchandise will all be bundled in one section of the souk. From an economics perspective, it’s wonderful; the competition helps keep prices low. The market I most often visit, naturally, is a vegetable souk that’s a convenient 10-minute walk from my house. I’ve posted pictures on my Facebook Page. The first time I visited, I couldn’t help but think this is what a real farmer’s market feels like. Mountains of vegetables that look like they have just been picked, bargains belted by vendors at every stand, and amazing prices. 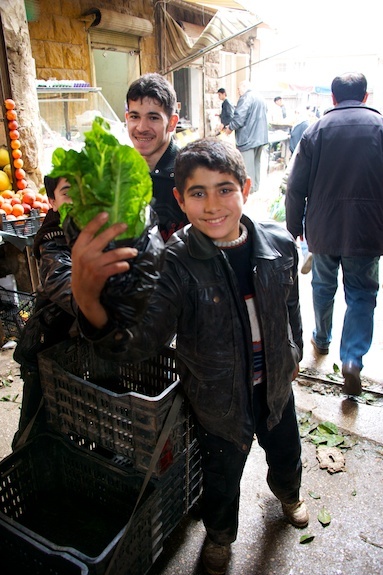 The kids in the market love showing me around — they compete for my hand and pull me towards their favorite stands. The Swiss chard at the souk caught my eye; its over-sized dark green leaves are hard to miss. 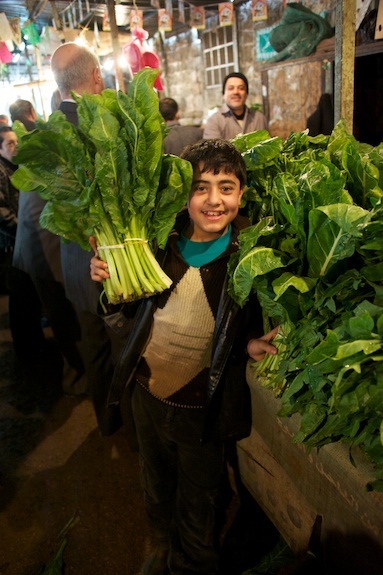 Aleppo is known as the mother city of stuffed vegetables and kibab. It’s a popular saying here, “حلب أم الكبب و المحاشي”. This was my inspiration for today’s post. Kibab, plural for kibbeh, are small torpedo-shape balls, pointy on both ends, made from minced meat and fine bulgur (cracked wheat). This is a classic preparation across the Levant and anything that slightly resembles this paradigm is dubbed, kibbeh. Aleppo is famous for its endless variations: with sour cherries or quince; carrots or pumpkin; yogurt or broth; raw or cooked; fried or baked; boiled or grilled. I can go on. This is a topic that, rightfully so, deserves its own blog post. Today, however, I want to focus on the first half of the saying–that is, the stuffed vegetables. Like kibab, Aleppans are also known for their variety of stuffed vegetables: eggplants, zucchini, peppers, grape leaves, cabbage leaves, tomatoes, potatoes; I’m sure I’m forgetting a lot. As of lately, my favorite has been the stuffed Swiss chard leaves. I had them for the first time a few months ago on a chilly winter afternoon in Aleppo. My grandmother’s sister prepared a batch one afternoon for me to try. 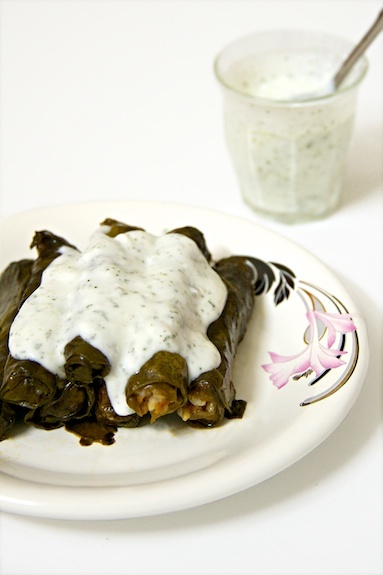 The stuffed chard leaves looked almost like over-stuffed grape leaves, but with a more pronounced dark green color. They also seemed softer in texture, as I noticed a few inside the pot had broken down in the simmering broth. Before we sat down to eat, my grandmother’s sister asked me to mince some garlic; it’s for the sauce, she said. She added the fragrant garlic bits into a bowl of pearly white yogurt, sprinkled a small handful of dried mint, and stirred. It looked beautiful. The specks of bright green mint stood out in the creamy yogurt. 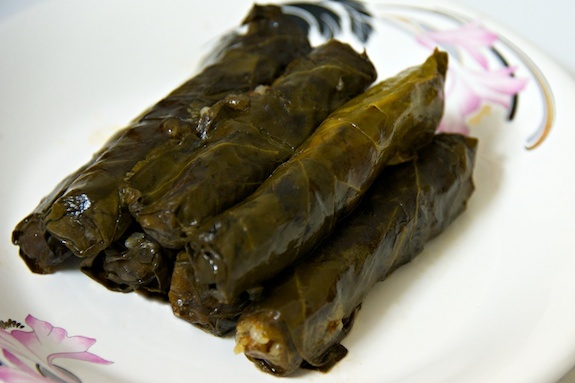 As she carried the pot of stuffed chard leaves to the table she told me this used to be my grandfather’s favorite dish. “Allah yerhamo,” she said (May he rest in peace). I took another bite, this time with the yogurt. Had I been a cartoon character, this is when fireworks would be happening in my eyes. The difference is incredible. The sauce brings the dish to life. The garlic flavor is intense, but the yogurt helps round out its sharp edges–it also helps cool the palate. I practiced making this dish on my own, and I think I finally got it right. I got excellent reviews from a couple expert Aleppan home cooks. This is one of those dishes that takes time, but is worth every minute of rolling. Invite friends who like to cook, put on your favorite movie and enjoy. As I mentioned before, the vegetables from the souk feel like they have just been picked from the ground. 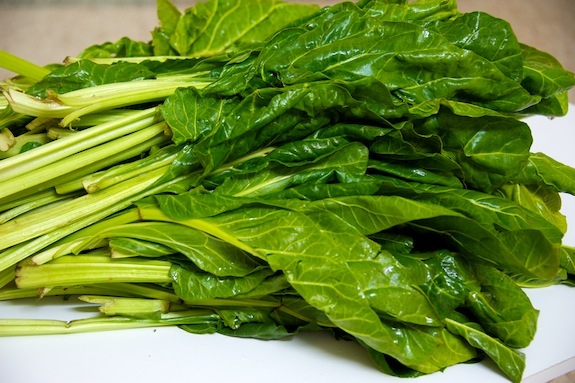 Swiss chard leaves are particularly dirty and can have dirt stuck to the leaves. For this reason, I go through a thorough cleaning process. First, I fill my sink up with water and wash off as much of the dirt as I can. Next, I bring a large pot of salted water to a boil, and prepare three separate bowls, or in my case buckets, of ice water. First, I blanch the leaves in the boiling water for a few seconds, and wash them off, in procession, three times, once in each ice bath. This helps me make sure the leaves are clean and ready for rolling. I bought this bottle from the souk, but I would like to write more about the process of preparing the water later in the summer. Rinse the rice under cold water 2-3 times and set aside. Wash the Swiss chard leaves well, preferably in a deep sink so that all the dirt can fall to the bottom. Remove the stem from all the Swiss chard leaves. Fill a large pot with water and bring to a rolling boil. Season the water with salt (not precise, a 2-3 teaspoons). 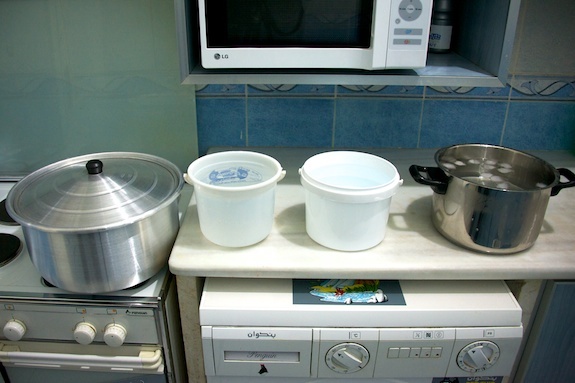 Prepare three bowls with ice cold water. Submerge a handful of the Swiss chard leaves into the boiling water for 7-10 seconds or until barely wilted. Quickly remove from the boiling water and transfer to the first ice-water bowl. Rinse, and move to the second bowl, and finally the third. This will ensure that the leaves are clean. 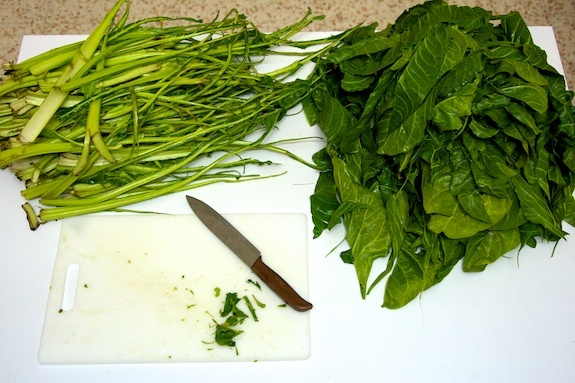 Strain the blanched leaves from the ice-water and set aside for rolling. 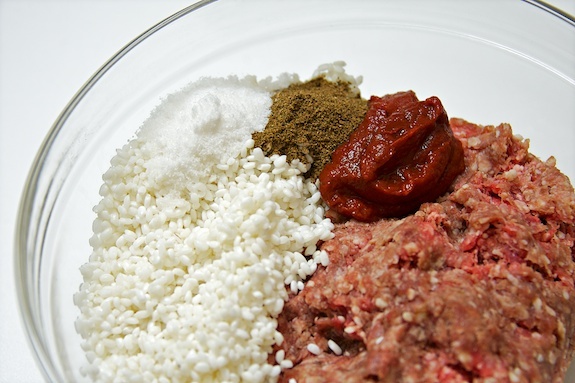 In a big bowl mix together the ground beef, rice, salt, allspice, and tomato paste. To stuff the blanched chard you want to cut the leaves so they are approximately 3-4 inch long. Align 2-3 of the shortened chard leaves side-by-side so they overlap a little–you should have something that resembles a wide rectangle at this point. Form a horizontal mound of the meat mixture slightly above the base of the rectangle, but don’t go all the way to the sides. Fold in the sides in, and roll the leaf from the base so that the meat mixture is enclosed. Do this until the meat mixture is finished*. Throw any leaf scraps in the bottom of a medium-to-large pot. Arrange the stuffed Swiss chard inside the pot. Season the sour grape juice (mayy husrom)* with salt, mix, and add to the stuff Swiss chard leaves. Fill the rest of the pot with water until it completely covers the stuffed Swiss chard leaves by 1-2 fingers. Press down the stuffed leaves with an inverted heat resistant plate and add a can of beans (or anything heavy) over the top–this will keep the stuffed leaves intact while cooking and prevent them from unravelling or breaking. Bring to a boil then lower the heat to low and continue cooking for 40-50 minutes, or until the leaves are tender. 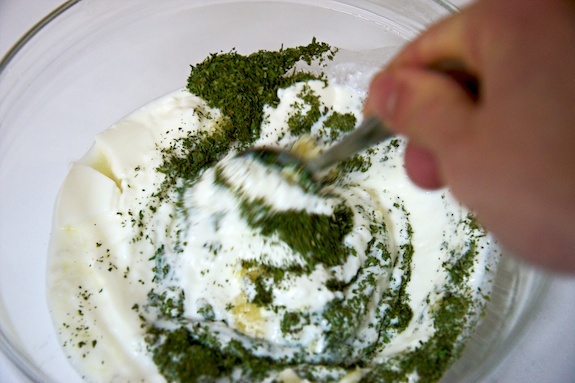 Prepare the yogurt sauce by mixing the yogurt, minced garlic, dried mint, and salt together. Serve the hot stuffed Swiss chard leaves alongside the cool yogurt sauce. Notes: Leftover chard leaves can be sauteed with olive oil, garlic, dried coriander, and salt; served with rice; and eaten as a meal. 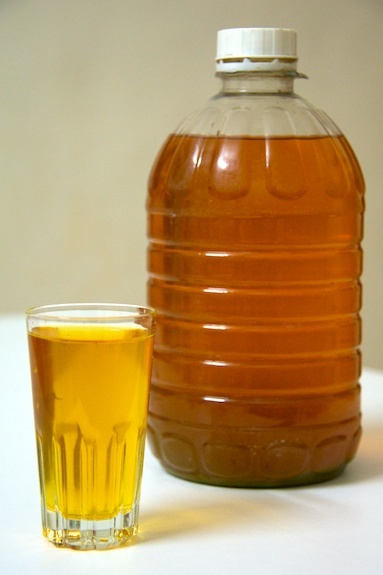 You can substitute the sour grape juice (mayy husrom) with lemon juice.